Weintraub, K., Autism counts. Nature, 2011. 479(7371): 22-4. So is there an epidemic of kids who are “not charming little extroverts”? It depends on who you ask. I don’t think it’s very often Prof Attwood is lumped with ‘flat-earthers’. But you can see the change in perspective from one side looking objectively to the other who need for there to be an “epidemic” of autism in order to strengthen their case. So who’s right? 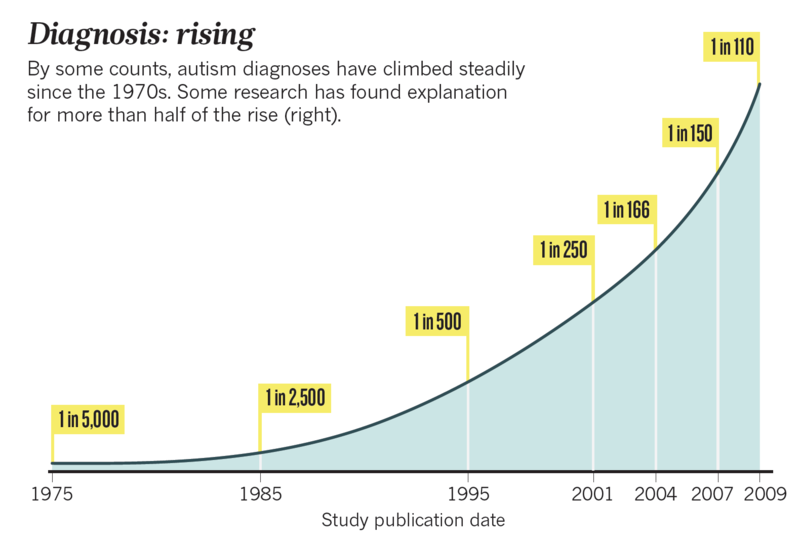 To see if this autism “epidemic” hypothesis has any real merit, we need to delve into some numbers. Incidence: For any health-related condition or illness, incidence refers to the number of people who’ve newly acquired this condition. Prevalence: Prevalence concerns the number of people who have this condition over a defined time interval. The other thing to remember from my last blog is that initially autism was only diagnosed on the strict rules of Kanner, and was considered to be a single disease caused mainly by bad parenting . So through the 1960’s and 1970’s, only the most severe children were diagnosed as having autism because the high-functioning autism would not have met Kanners criteria, and even if they did, most parents didn’t want the label for fear of the social stigma. So then, what are the numbers? The early prevalence was estimated to be less than 5/10,000 or 1 in 2000, although in surveys done after 1987, the numbers began to rise past 7/10,000. In the 1990’s, Autism prevalence climbed into the teens and the latest prevalence has been documented for autism is 20.6/10,000. But that’s only about 1 in 485. The CDC estimated a prevalence of 1 in 88 (113/10,000). Where did the other 400 people go? This is where the importance of definitions is highlighted. Autism is considered part of a spectrum, and at the time of the surveys reviewed by Fombonne, DSM III then DSM IV considered conditions like Pervasive Developmental Disorder and then Aspergers Disorder to be part of that spectrum. Adding in the rate of PDD and you have a figure of 57.7/10,000 and adding in Aspergers gives you a combined rate of 63.7/10,000, or 1 in 157 people surveyed. So if there has been a fifty-fold change in prevalence (from 5 to 264 cases per 10,000 people) in just thirty years, isn’t that an epidemic? Fombonne agrees. “As it stands now, the recent upward trend in estimates of prevalence cannot be directly attributed to an increase in the incidence of the disorder.” He said later in the article that a true increase in the incidence could not be ruled out, but that the current epidemiological data which specifically studied the incidence of autism over time was not strong enough to draw conclusions. While there’s no epidemic, there is the real issue of the genuinely increasing prevalence. Why the rise in those numbers? Fombonne went on to explain, “There is good evidence that changes in diagnostic criteria, diagnostic substitution, changes in the policies for special education, and the increasing availability of services are responsible for the higher prevalence figures.” Nature published a graph from the work of Professor Peter Bearman, showing that 54% of the rise in the prevalence of autism could be explained by the refining of the diagnosis, greater awareness, an increase in the parental age, and clustering of cases in certain geographic areas. There is no autism epidemic, just medical science and our population realising just how common autism is as the definition becomes more refined, people become more aware, and some other biosocial factors come into play. What can we take from the numbers? That we’re being overtaken by Sheldon clones? That soon there will be no more “charming little extroverts”? If the CDC figure is accurate, then one person in every hundred is on the spectrum, so the world is hardly being overtaken by autism. But the take home message is that Autism Spectrum Disorders are more common that we ever thought, and there are more people on the spectrum “hiding in plain sight”. 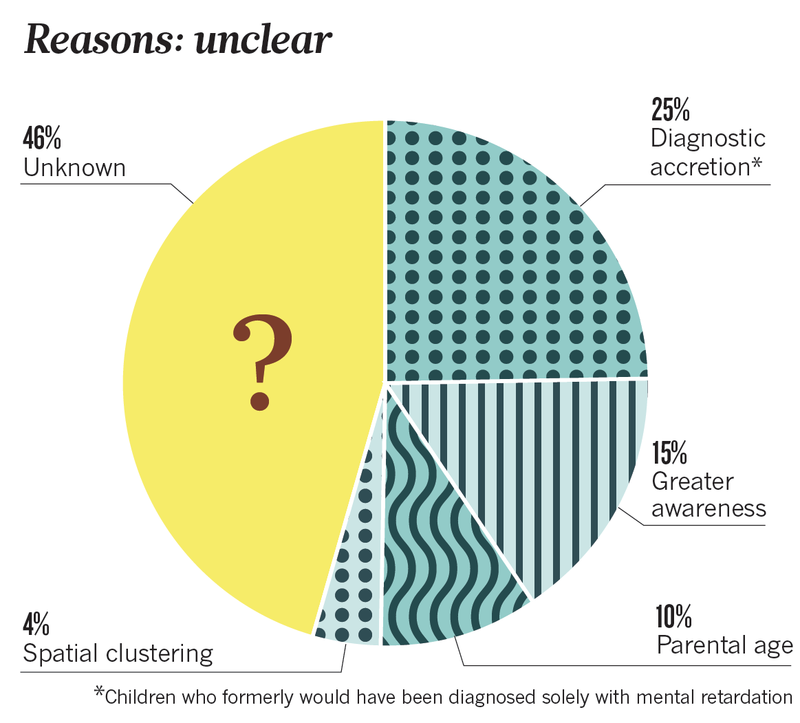 If the study from South Korea is accurate then one person in every thirty-eight is on the spectrum, but two thirds of them are undiagnosed. Should there be more funding, more resources, or more political representation for people on the spectrum? Perhaps, although the public and research funds are not unlimited, and other health concerns should also be treated fairly. But since autism is life long and impacts on so many areas of mental health and education, understanding autism and managing it early could save governments billions of dollars into the future. Rather, I think that the climbing prevalence of ASD is a clarion call for understanding and tolerance. If we learn to tolerate differences and practice discretionary inclusion, then both the autistic and the neuro-typical can benefit from the other. That’s a world which we’d all like to live. 1. Bolt, A. If the autistic don’t get full cover, where’s the money going? 2013 2013 May 11]; Available from: http://blogs.news.com.au/heraldsun/andrewbolt/index.php/heraldsun/comments/if_the_autistic_dont_get_full_cover_wheres_the_money_going/. 2. Rimland, B., The autism epidemic, vaccinations, and mercury. Journal of Nutritional and Environmental Medicine, 2000. 10(4): 261-6. 3. Attwood, T., The Autism Epidemic: Real or Imagined, in Autism Aspergers Digest2000, Future Horizons Inc: Arlington, TX. 4. Schoenborn, B. and Snyder, R., Physician Assistant Exam For Dummies. 2012: John Wiley & Sons. 5. Pitt, C.E. Autism Series 2013 – Part 2: The History Of Autism. 2013 [cited 2013 2013 Aug 15]; Available from: https://cedwardpitt.com/2013/08/15/autism-series-2013-part-2-the-history-of-autism/. 6. Rice, C.E., et al., Evaluating Changes in the Prevalence of the Autism Spectrum Disorders (ASDs). Public Health Reviews. 34(2). 7. Fombonne, E., Epidemiology of pervasive developmental disorders. Pediatric research, 2009. 65(6): 591-8. 8. Baio, J., Prevalence of Autism Spectrum Disorders: Autism and Developmental Disabilities Monitoring Network, 14 Sites, United States, 2008. Morbidity and Mortality Weekly Report. Surveillance Summaries. Volume 61, Number 3. Centers for Disease Control and Prevention, 2012. 9. Kim, Y.S., et al., Prevalence of autism spectrum disorders in a total population sample. American Journal of Psychiatry, 2011. 168(9): 904-12. 10. “Epidemic vs Pandemic”. 2013 [cited 2013 Sept 03]; Available from: http://www.diffen.com/difference/Epidemic_vs_Pandemic. 11. Weintraub, K., Autism counts. Nature, 2011. 479(7371): 22-4. This entry was posted in Biological, Psychological, Social and tagged acceptance, ADHD, age, anxiety, ASD, aspergers, attwood, autism, autism epidemic, autism spectrum disorder, autism spectrum disorders, bearman, brain damage, CDC, children with autism, children with autism spectrum disorders, disorder, epidemiology, extrovert, fombonne, funding, incidence, inclusion, introvert, kanner, maternal, mercury, nature, paternal, prevalence, psychologist, psychology, science, spectrum, statistics, thought, tolerance, tony attwood, understanding, vaccine by cedwardpitt. Bookmark the permalink. Thank you very much for informative blog. I’m a first year student in Msc Psychology. I have a degree in marketing and statistics. I only new about Dr Leaf’s on TBN today. I then googled her does how I came across with your site. In short I agree with referencing especially for her with a PHD. Our God the creator deals with reference in the bible. She has to do the same to be a good exemplary to us who are interested in science and God ways. Thanks for the kind encouragement. Please spread the word about your concerns on Dr Leaf’s teachings, and I wish you all the best for your Masters.